The ultimate in convenience and flavor! Celebrated by Bon Appetit and The Food Channel, this juicy, sweet and cob-smoked ham is the best in the market! 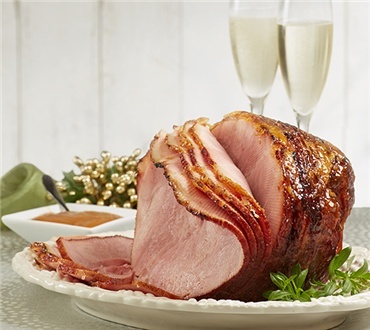 No need to cook or carve, we spiral-slice this ham in perfect 1/8" slices, then hand-glaze it with our own Pure Vermont Maple Syrup, maple sugar and spices to give it an exquisite flavor. Serve at room temperature or warmed gently. I have gotten this ham in the past, and it was pretty good. This one was terrible. Lots of fat in it, which was gross. I had two bites that had large bits of bone. One nearly broke a crown. I will not order again. We hosted 17 people for Thanksgiving! Everyone RAVED about how great the ham tasted. The advantage for the cook was the ham was fully cooked and all I had to do was slowly heat the ham and serve. Great Ham, everyone loved it! !